When it comes to comics, Courtney Loberg takes it panel by panel. A master's student in creative writing, Loberg is also a sessional lecturer in the Depart­ment of Art and Art History. This past September, she taught an inaugural art class in making comics. Her interest in comics was sparked while she was an undergraduate student at the University of Victoria. After completing a bachelor of fine arts in visual arts and creative writing, she moved to Saskatoon to begin her master's degree in creative writing. Last spring, she spoke with Allyson Glenn, an assistant professor in the Department of Art and Art History, about doing an interdisciplinary course in comics. 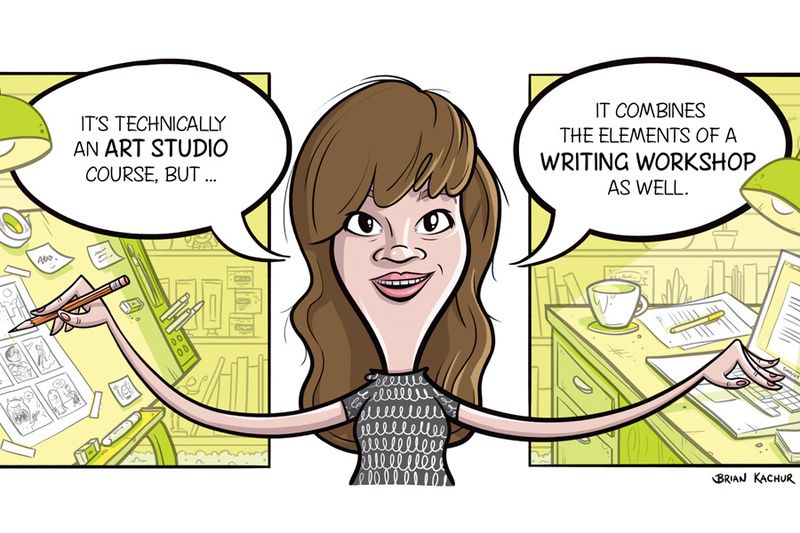 Influenced and inspired by the work she completed during her under­graduate degree, she designed a 300-level interdisciplinary art class on making comics. "It's technically an art studio course, but it combines the elements of a writing workshop as well," said Loberg. The course had plenty of in-class drawing and writing exercises, explained Loberg, and the final project involved creating an eight-to-10-page comic. Other assignments along the way, such as character devel­opment, thumbnail design and script writing, helped students build up to that. Since there is a creative writing aspect in the course, many of the larger assignments were workshopped in class. "Everyone got to see each other's work and offer comments and constructive feedback," she said. The class also benefitted from guest lecturers: Glenn focused on drawing composi­tion and John Bath, an assistant professor in the department, taught a class on comic theory. "He talked a lot about panel transition," added Loberg. "There's a lot of technical, compositional and narrative thought and practice that goes into the creation of a comic." Loberg designed the class to be as interdisciplinary as possible, which worked well: while the majority of students in the class were art majors, it also attracted students from history and computer science. That was not too surprising to her, given the rise of similar mediums such as graphic novels, not to mention the proliferation of independent and web comics in recent years. "The internet has made underground comics and art comics a lot more accessible for a wide readership, which is awesome," she said. "That's such a big part of it—reproducing the work and making it available to a lot of people." Loberg is hopeful she can teach the class again, and wants to adjust the structure if she does. "It's a new course so I'm trying to work out the best way to build the projects throughout the term so it's most helpful to students," she said. And her favourite comic? "I don't know that I have a favourite, but Virtual Candle is a web and print comic by an artist called HTML Flowers. It's amazing—highly recom­mended!"